An international student looking for a rewarding and stable career might find themselves studying a nursing degree. With the many paths and specialties, there are countless opportunities for nursing students. If you want a career working closely with patients and where you can make a difference, studying a degree in nursing may be right for you. Choosing to study nursing in the USA gives you the opportunity to take the path that best fits your interests and to build a career around your strengths. Completing a degree in nursing provides you with the skills and knowledge to become a hospital nurse, or to enter an alternative career in research, specialist consultancy or other options. While more than half of all employed nurses are based in a hospital, nursing students can also continue their studies to go into specialist nursing fields. Hospital nurses also have many career options within the healthcare system including work in Medical-Surgery, ED/ER (Emergency), B (Obstetrics), S (Pediatrics), and ICU/NICU (Intensive Care and Oncology), to name a few. Alternatively, if you want to experience different types of nursing you can be a "floater," a nurse that rotates across various departments and floors. Outside of the hospital environment, an office nurse cares for patients in a doctor's office, at an outpatient clinic or at an outpatient surgical center. These nurses prepare patients for routine examinations, administer injections and medications, dress wounds and incisions, and assist the healthcare team with minor surgeries. Public health nurses work with communities such as schools or small groups to improve overall public health in the area. They provide instruction and guidance regarding health issues such as disease prevention, nutrition, and childcare. These public health nurses arrange health screenings for immunizations, blood pressure testing, mammograms, and HIV/AIDS testing. Long-term care nurses manage nursing care for residents with conditions ranging from minor health care issues to Alzheimer's disease. They are usually based in an assisted living facility or a nursing home. Home-health nurses provide patient care through home-calls. They visit patients in their houses instead of in the clinic. Many of their patients may require long or short-term care, for example, when recovering from an illness or accident. Finally, hospice care nurses work with patients who are terminally ill, at home or in a hospice, supporting them throughout their illness. It is important that students who plan to study nursing have a sense of compassion, empathy and common-sense and are willing to provide mental and physical care to patients and their families. All nurses are expected to share information about various medical conditions to those in their care, in a compassionate, clear and professional manner. Nurses will often work more closely with individual patients than doctors and will be expected to have a good bedside-manner in all situations. Most nurses also work closely with their co-workers including doctors, administrative workers, analysts and laboratory technicians, meaning they have to establish good working relationships with different types people on a daily basis. Critical thinking, good decision making, and problem solving are essential for any international student interested in studying nursing in the US. Communication skills such as - verbal, non-verbal and written, are expected. Studying nursing as an international student who speaks more than one language can be an asset as it could well be needed during patient-care. When treating patients, it is important that nurses are confident, communicate clearly and build a relationship of trust with their patients who are likely scared and confused. It is the nurse’s job to settle patient fears, provide general support to patients during their illness, and clear doubts about their condition or treatment. There has been significant development in the field of nursing in recent years thanks to the advancement of new medical technology and treatments. There are now more opportunities for nurses with specialists, who are trained to use new equipment and analyze results. New advancements in diagnosis and treatment have changed the general approach to patient care. And as the population is aging, and more elderly people require care, opportunities for nurses are constantly increasing. Modern health care is often aimed toward the ongoing treatment of patients with chronic conditions, such as diabetes, hypertension, arthritis, cardiovascular disease, and mental health deterioration. 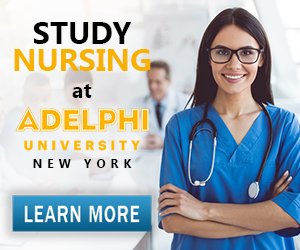 Studying nursing in the US promises great employment opportunities after graduation, offers the chance to study different specialisms, and provides the variety of courses and paths for students to choose the type of nursing that is right for them. Different jobs have different expectations, some nurses will choose to work nine-to-five, while others will prefer the fast-paced hospital environment working 12-hour shifts. Both the pay and the type of work nurses carry out can be extremely rewarding, but also draining, so it’s important to choose the career option that best fits your expectations and become the best nurse you can be. Visit the Study in the USA School search to find schools that offer programs of study in Nursing. Over time we will be updating this section and including more information for those who want to study nursing in the USA and for other countries, but please feel free to post your thoughts and comments on our Facebook fan page, and also follow us and post questions through Twitter.